Volcanic has another new team member! Steven Thompson is our Design wiz, and will be working his magic on our unique platform. Maybe it’s the new brand of coffee we’re gulping down, but with Steven in the office we’re all of a buzz about what we offer the Recruitment industry. After exploring the role of website functionality in our post ‘Defining User Experience’, I’d like to start an investigation into what great Design looks like for a Recruitment website, beginning with Home Page Features. It’s a topic our platform demo videos have touched on, and it’s a fairly straight-forward process to describe - just think like a Candidate. So, first question. What are the common practices/features of Recruitment websites, and what can you do to innovate them? These are the bare-bones features that candidates will expect. At Volcanic we place User Experience at the heart of our design - take a look at a wireframe image of one of our client sites here. The use of Paralax Scrolling allows for a sense of depth, the Nav Bars are clearly defined and spaced, and that all-important Search Bar is front and centre of the site. 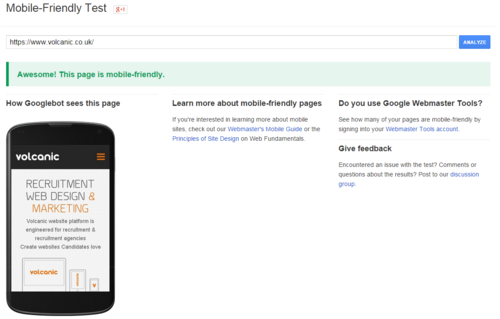 Of course, designing Mobile-Friendly should be among your top priorities. Displaying interesting Company Statistics can cut out much of the need to search the site, and therefore retain attention. We are statistic-driven animals - make it a snappy feature, not a boring page buried somewhere in the bowels of your sitemap. If you read our post last week on innovation - right here, you will know that an innovative idea doesn’t necessarily have to be original, it just has to elevate/progress your visibility - usually by demonstrating that you are one step ahead of the trend. Social Integration is one such feature that you can be creative with, particularly in light of the rise of Social Recruitment stories popping up in the last year. We use the Social Stream provided by Eventbeat as a way of showcasing our social network while retaining attention on to the Home page. Handy!